2011 not only marks the D-backs’ 10-year anniversary of their 2001 World Championship club, it’s also the 10th anniversary of the franchise’s first-ever Home Run Derby win. 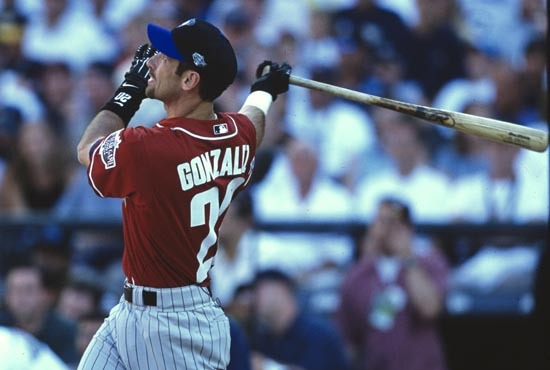 Gonzo hammered a total of 16 longballs in his lone Derby appearance, outdueling runner-up and defending champ, Sammy Sosa. And the performance was no fluke. The five-time All-Star went on to set a D-backs franchise record with 57 home runs in the regular season. “When you get selected or chosen to be in a contest like that, you’re first thought is, ‘Just let me get one homer.’ I was able to take (my batting practice pitcher) Jeff Motuzas, who still throws BP here. He threw to me every single day that I was here as a Diamondback. I think what people fail to realize is how important those guys are. They’re just as important as a guy going up to the plate to hit. So it was a comfort factor for me going up there and being up at the plate with him.